As in previous years we will be holding senior and junior coaching sessions on the following dates at Montsaye Academy Rothwell. Within this format we are also hoping to develop our county’s coaches. There will be opportunity for less experienced coaches (those entering level 1 coaching and recently qualified level 1 coaches) to work alongside more experienced coaches from both inside and outside our county. For Archers, both the senior and junior coaching sessions will be aimed at the intermediate archer looking to improve technique and performance. The sessions will include strength and conditioning, bow set up/ bow tuning technique and the mental approach. The sessions will be open to all bow styles. 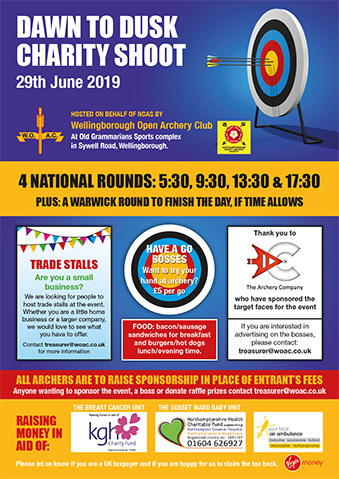 There will be a cost to archers for these sessions and NCAS will be providing a subsidy, but until numbers are known the actual cost cannot be determined. As a guidance last year the cost was £25 each for all 5 sessions. If you would be interested in reserving a place please contact me with the following details.